Volunteers are the heart and soul of Free 2 Teach. It takes a team of dedicated volunteers to operate the Free 2 Teach store and we are always looking for new members. We have volunteer opportunities for individuals, groups, or businesses; during store hours, after hours, evenings, and weekends. Come for any amount of time you are available! We strive to be as flexible as possible to accommodate your busy schedule. Tuesday & Thursday 2:45pm-6:00pm AND the 1st Saturday of each month 9:00am-12:00pm (during the school year). You can also assist our teachers in a number of areas: greet and help them check-in, provide assistance as they shop, help with the computerized check-out process. You will become acquainted with the store’s shopping procedures and policies so that you can answer any questions the teachers might have. You will help us stock, restock, sort, and stage merchandise throughout the store. We need responsible volunteer drivers to help pick-up supply donations. Interested in learning more? Contact Jennifer at jennifer.free2teach@gmail.com. Evening and weekend availability for groups and businesses. Contact Jennifer at jennifer.free2teach@gmail.com. If you have a special skill set that could contribute to the running of Free 2 Teach, we are happy to have your help! Contact Eula at eula@free-2-teach.org. Do I have to volunteer for a certain length of time? We do have pre-selected shift times on our sign-up calendar. However, if you are unable to work an entire shift, that’s fine! Just make a note of that when you sign-up. Are there low impact tasks for elderly or pregnant volunteers? Yes, we have many tasks that can be done sitting down. After I arrive will I get clear directions on what to do? Yes. Upon arrival you will be greeted by the Store Manager or Volunteer Coordinator. You will then be taken on a brief tour of the facility and you will learn more about the mission of Free 2 Teach. There will be a waiver for you to review and sign. You will also be provided with clear instructions on the volunteer work you will be helping with for that day. Are there clothing suggestions for when I volunteer? 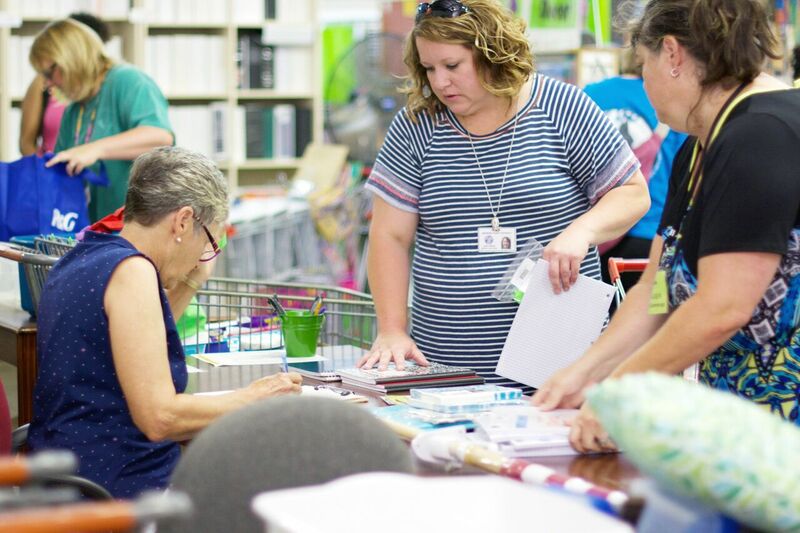 If you are helping with stocking or sorting, the warehouse portion of the store can be chilly in the winter and warm in the summer. We also recommend closed-toe shoes for stocking and sorting. Is there a place where I can take a break, eat lunch, and put my personal belongings while I volunteer? Yes, we have cubbies to place belongings, and we have a break area to eat lunch and to take a break. My office/church/organization wants to volunteer. Can you accommodate us? Yes, we can accommodate groups. We even have opportunities on evenings or Saturdays. Please arrange your group as far in advance as possible by emailing your request to info@free-2-teach.org. All volunteers must be at least 12 years of age. Volunteers under the age of 14 must be accompanied by a parent or guardian. All volunteers under the age of 18 must have a parent or guardian signature on their release form. Volunteer groups with children between ages of 12-14 must have at least one adult chaperone for every five volunteers. Can students volunteer at Free 2 Teach to fulfill community service hours? Yes. Middle school and high school students looking to fulfill community service hours may volunteer. Those between the ages of 12-14 must be accompanied by a parent or guardian. Your donation benefits your community. Free 2 Teach is a 501(c)(3) nonprofit organization. Give your time. We have volunteer opportunities for individuals, groups or businesses. By coordinating a school supply drive, you will greatly contribute to our stock. We would love to partner with your organization to support our mission at Free 2 Teach.